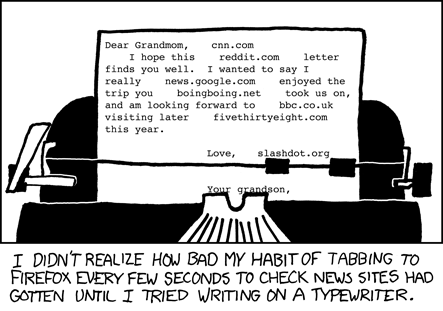 xkcd and typewriters, it doesn’t get any better! I’d like to see the collected compendium (redundant?) of typewriter comics published someday. I know of at least three people who’d be interested. Perhaps they’d be the only three, though, in total. Actually I typed a double space between sentences on computers for years, a holdover from some weird typing rule I learned in junior high, rapping away on some old Selectric in typing class. I still wrestle with the double-space thing with many clients. What gets me though is that some people have told me that they’re just following Chicago or the GPO style manual, which (they insist) REQUIRES it. BZZZT. Sorry, that answer is incorrect. Thanks for playing “Bluff the Writer,” we have some lovely parting gifts.